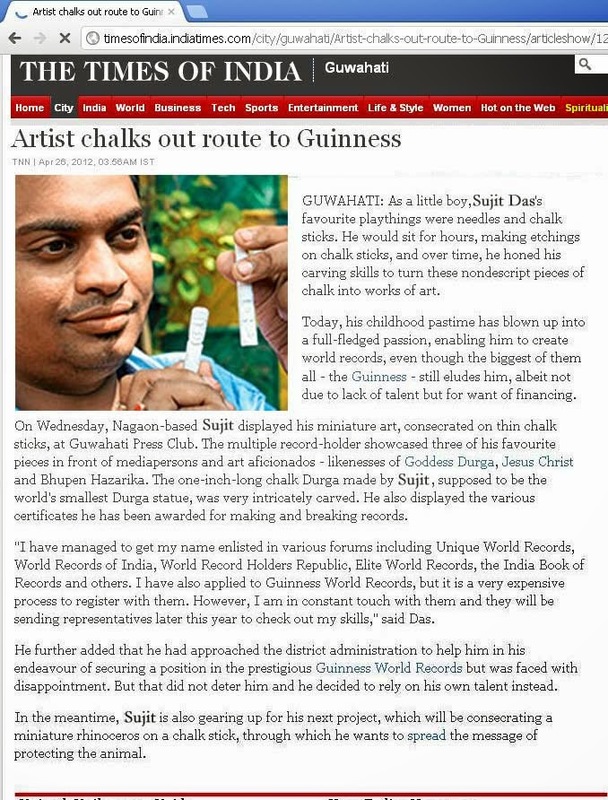 A bachelor in Mass Communication and diploma in Visual Arts, Nagaon-based artist Sujit Das has made a niche for himself and created a world record by making the smallest Durga idol in chalk. 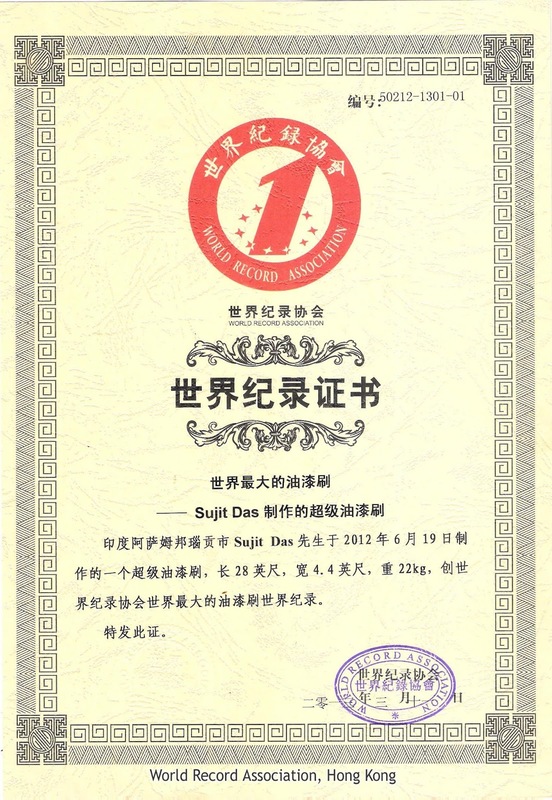 Sujit has got many awards and recognitions from various authorities. 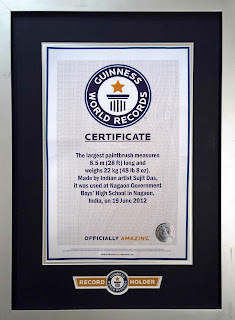 Artist Sujit Das has collected numerous awards, national and international. 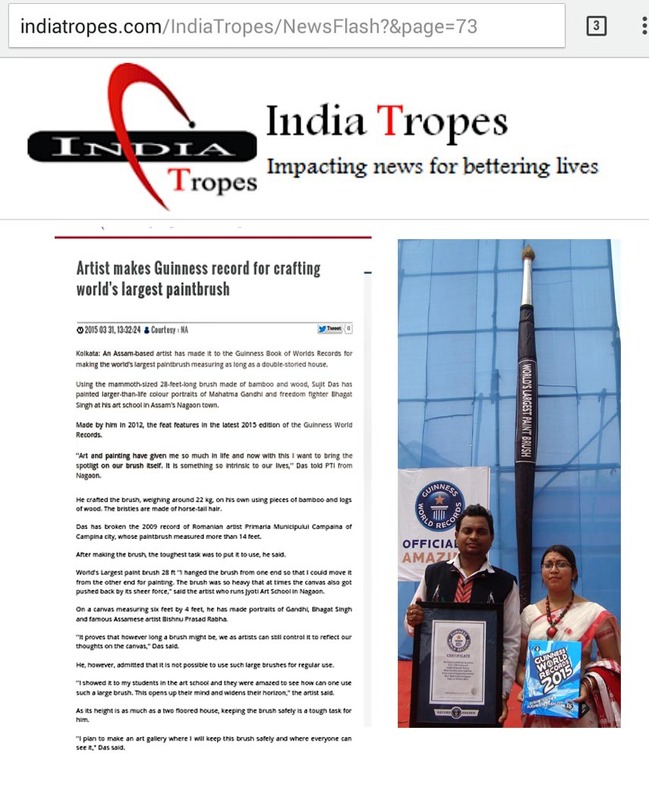 His chosen field of work in which he is enormously gifted has now taken him to the Guinness World Records. His paintings exhibited at DOT ART GALLERY, Bangkok (Thailand), ABU DHABI ART HUB GALLERY (UAE), London Art Festival (UK), American Center (U.S. Embassy), International Painting Exhibition - Bhutan & Dubai, Lalit Kala Akademi (New Delhi), Academy of Fine Arts (Kolkata) etc. Sujit made a World’s Largest Paint Brush measured 28ft in Length, 4.4 feet in breadth, weighs 22 KGs and on 19th of June 2012, he successfully painted the portraits of Mahatma Gandhi, Swahid Bhagat Singh and Bishnu Prasad Rabha on canvas at Nagaon Govt Boys H S School, Nagaon infornt of thousand of people and media personals. 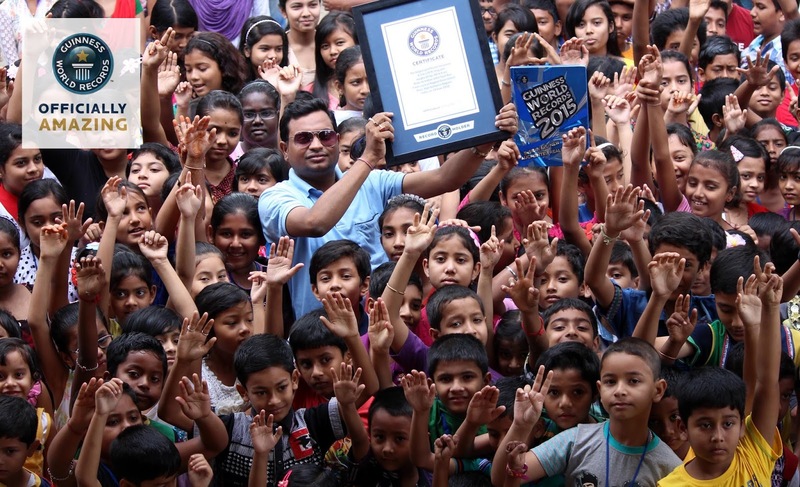 The World Record Attempt was organized by Jyoti Academy, Nagaon, Assam. 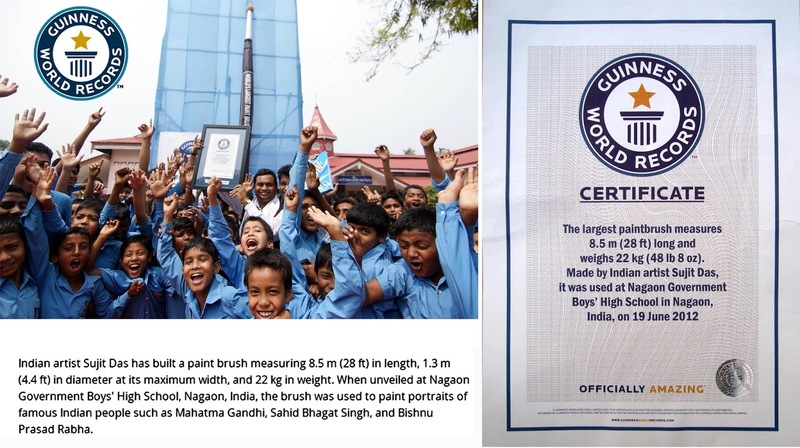 The Largest Paint Brush has been published by Guinness World Records 2015 edition in page no. 94. 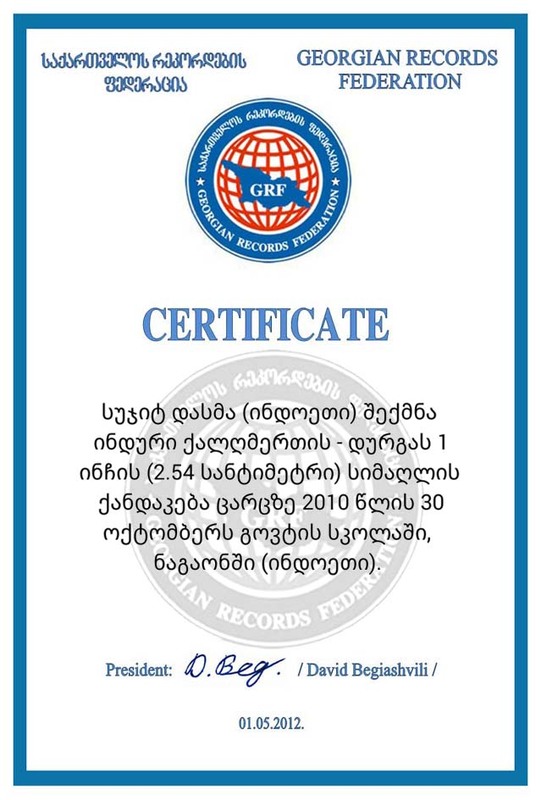 Limca Book of Records for 2013 edition, The Book of Alternative Records (UK), RecordSetter World Records (New York) and World Records Association (Hong Kong) etc. 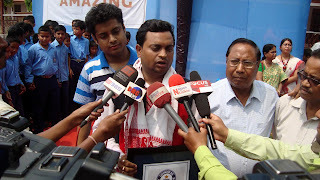 Sujit Das was born to Kamakhya Ch Das and Khama Das of Nagaon, Assam. He faced many hardships during his childhood due to economic crisis. 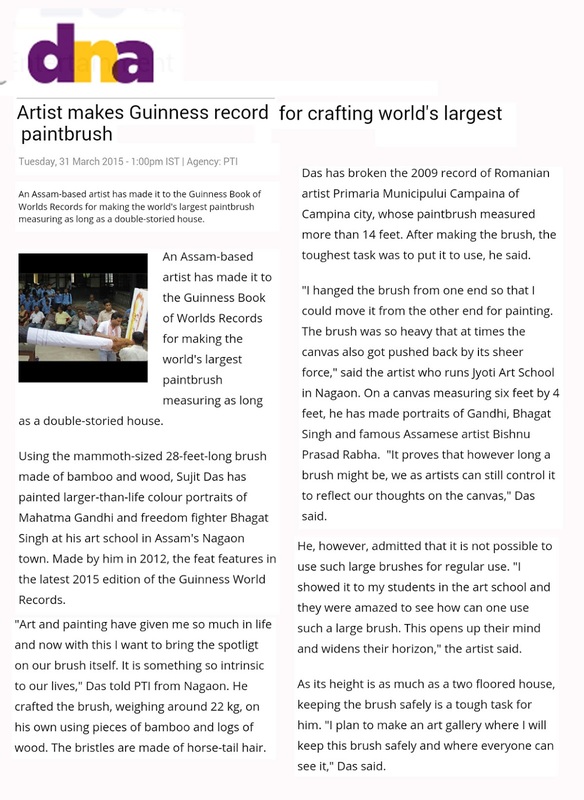 It almost marred his dream to establish himself in the field of art, more aptly as an artist. 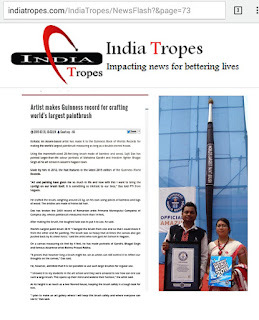 But he had this unwavering ability to do hard labour, amazing self confidence and unremitting belief in God which helped him to overcome those hurdles and finally he succeeded in collecting accolades and recognition. He had however been persistently bestowed with people’s blessings and affection. 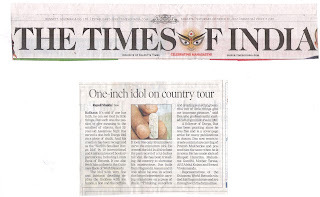 As a little boy, Sujit’s favourite playthings included colour, brush, needles, chalk etc. He would sit for hours making various drawings, paintings and etching sticks. He used to convert the stories he heard from his father during his childhood, into colourful paintings. 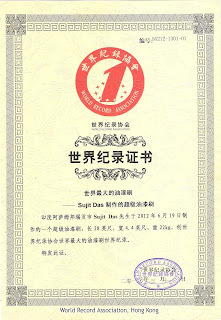 From a very early age, he used to participate in the art competitions, exhibitions etc. His paintings were greatly appreciated by the viewers and sometimes they used to purchase them. Alongside, he also grew a sharp interest in engraving on chalk sticks. People were influenced by the improved skills, techniques and new styles that he used in paintings and he was approached to design several cover pages of books ad now he is a well-known cover-page artist. 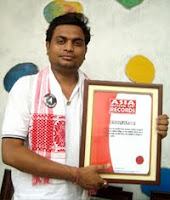 He also works for the famous Assamese colour comic for children ‘Rongmon’ and for the weekly news paper ‘Amar Nagaon’. 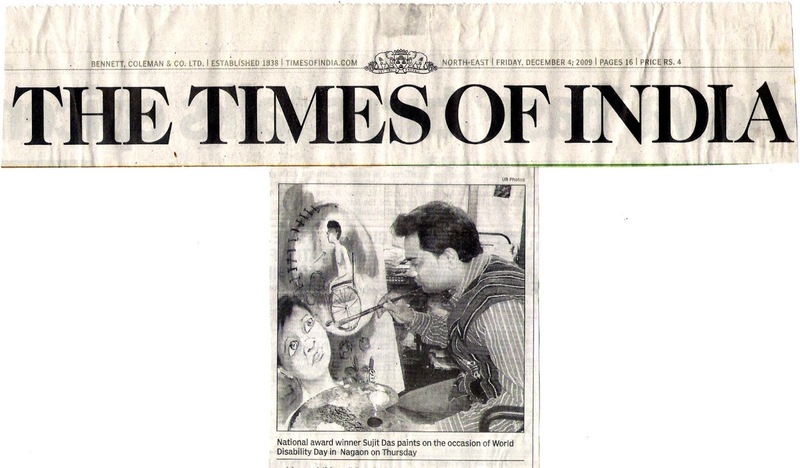 He opened an art school, Jyoti Art School in 1999 where at present, more than 500 students are learning art under his guidance. 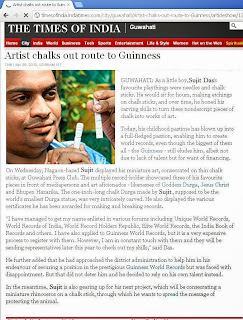 In 2010, he created an one inch Durga idol on a piece of chalk in 30 minutes through which he seeks an entry into the Book to be scripted as the creator of the Smallest Durga idol. 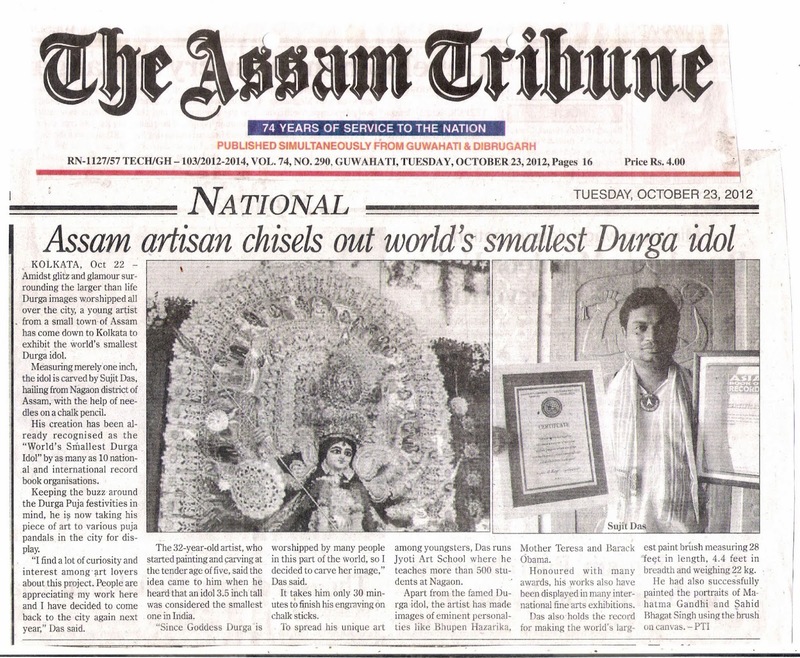 The idol has been already recognized as the ‘World’s Smallest Durga Idol’. 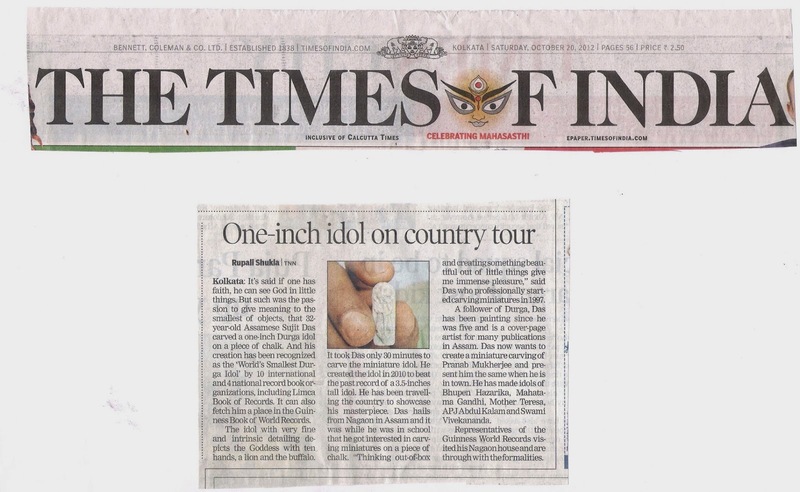 The official representatives of the record books had visited him in Nagaon and took measurements of his master piece and are likely to present him with the certificate for making the smallest idol of the goddess ever. Das has been carving idols in chalk pieces since 1997 . He however had a firm belief that his creation on shape of a God or Goddess was the only medium through which he would achieve international fame. 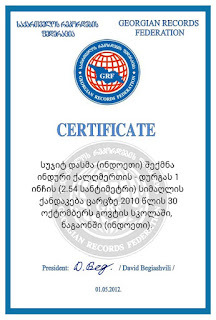 So, far his one-inch has been approved by the Official World Record- RecordSetter World Record, Georgian Records Federation. 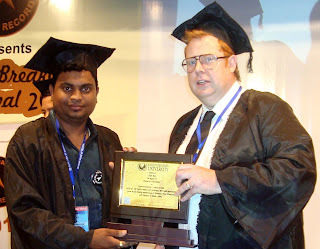 Moreover, he was also awarded with an international outstanding Achievement -Everest Award Nepal. Apart from the famed Durga idol Sujit has made several other idols including that of Bhupen Hazarika, Mother Teresa and Barack Obama which were appreciated by all and sundry. Sujit, an acclaimed artist always craves for new artistic goals. He says, “Creating something extraordinary gives me immense pleasure, so I prefer to think out-of-the box and may be for this very quality as many as 10 organizations have recognized my creation as one of the marvels on earth.” He has held various exhibitions in many parts of the country so far and his works also have been displayed in International fine arts exhibitions. 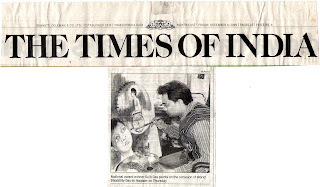 In 2002, he received the Lalit Kala Parishad Award from Lalit Kala Parishad Vishapatnam. In 2009, he was awarded with the National Award for Best Young Artist at Amritsar (Punjab) under Ministry of Youth Affairs & Sports, Govt of India. 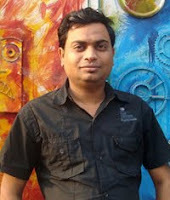 Sujit Das has a diploma in Visual Arts, SS-O-SP, Kolkata. He also has a Bachelor’s Degree in Mass Communication, Guwahati and a diploma in Electronic Engineering from Assam Institute of Electronics. Besides these, it is his unmatched creativity which always coerces him to create wonderful creations.